Page 4 PHILCON NEWS BIG POND FUND PHILCON CARNELL ENGLAND MAKE THIS REALLY A WORLD CONVENTION There have been thus far four World Science Fiction Conventions. However, despite the all-encompassing title "World Convention", no one from outside the confines of the USA has ever attended. It will be decidedly different story at THE PHILCON. 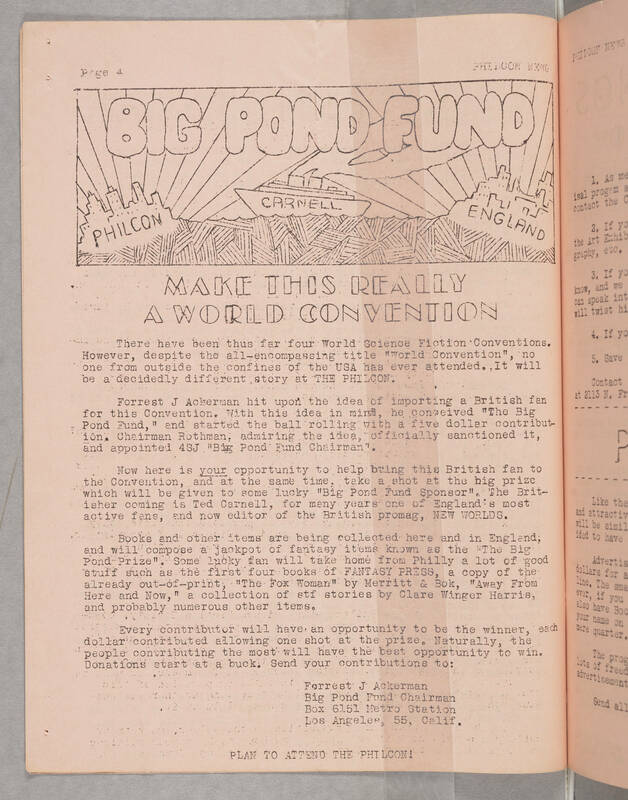 Forrest J Ackerman hit up oft the idea of importing a British fan for this Convention, with this idea in mind, he conceived "The Big Pond Fund," and started the ball rolling with a five dollar contribution. Chairman Rothman, admiring the idea, officially sanctioned it, and appointed 4SJ "Big Pond Fund Chairman". Now here is your opportunity to help bring this British fan to the Convention, and at the same time, take a shot at the big prize which will be given to some lucky "Big Pond Fund Sponsor". The Britisher coming is Ted Carnell, for many years-one of England's most active fans, and now editor of the British promag, NEW WORLDS. Books and other items are being collected here and in England; and will compose a jackpot of fantasy items known as the the Big Pond Prize". Some lucky fan will take home from Philly a lot of good stuff such as the first four books of FANTASY PRESS, a copy of the already out-of-print "The Fox Woman" by Merritt & Bok, "Away From Here and Now," a collection of stf stories by Clare Winger Harris, and probably numerous other items. Every contributor will have an opportunity to be the winner, each dollar contributed allowing one shot at the prize. Naturally, the people contributing the most will have the best opportunity to win. Donations start at a buck. Send your contributions to: Forrest J. Ackerman Big Pond Fun Chairman Box 6151 Metro Station Los Angeles, 55, Calif. PLAN TO ATTEND THE PHILCON!